Kitchen Table vs Dining Table: Eat-in Kitchen, Formal, Etc. What’s the Difference: Kitchen Table vs. Dining Table? 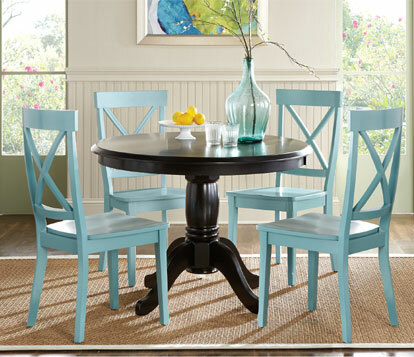 At Furniture.com, we get lots of questions about the difference between a kitchen table and a dining room table. The quick answer is “the only difference is the room it’s in.” But the full answer goes a little deeper. All homes are different, and lifestyles certainly continue to change. While traditional homes typically had space for both eat-in kitchens and dining rooms, newer open concept homes, smaller homes and apartments are designed to have space for just one table. With a singular table, you’ll choose just one that meets all of your needs. When you have both a eat in kitchen table and a dining room table, each will have a different function and purpose. A kitchen table implies all of the chaos and informalities that daily life holds – kitchens tend to be the hub of day-to-day activities, casual interactions of families, the hectic spot where food is prepped and more. Because kitchens are such busy places, when deciding what to choose for your eat-in setup you need to plan around traffic flow and activities. Often kitchen tables are smaller, less formal, less expensive and have more durable finishes than dining room tables. The chairs paired with a kitchen table follow suit, they tend to be more casual, less bulky and are armless (referred to side chairs rather than armchairs). Chances are your eat-in kitchen table would have just enough room seat your immediate family whereas the dining room table would be big enough to seat guests as well. 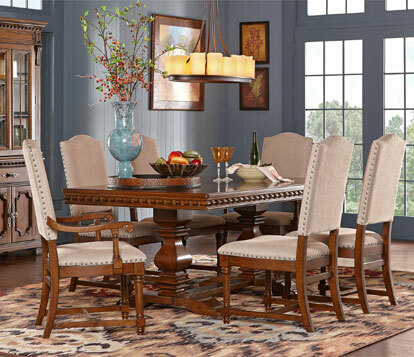 In a dining room, the table should afford diners a bit more elbow room. The chairs tend to be roomier and can be armchairs, side chairs or a mixture of both. These tables are more formal and since they are not subjected to daily use, the beauty and grace of finer finishes can be highlighted and will last longer. If your home has room for a kitchen table that fits the whole family comfortably, it will frequently be used daily for breakfast through dinner (including as a place for snacks, homework, projects and even games). In this case, the dining room table will likely be reserved for special occasions such as holiday meals, dinner parties and the like. For small a kitchen, you might choose a smaller bistro style table. Fitting two to four seats, bistro tables are great for for breakfast and grabbing a quick bite but don’t provide enough space for a sit-down, family-style meal. Look for a dining room table that will not only serve your needs for entertaining guests, but will also hold up to daily use for nightly dinners. Most stores, whether online or brick and mortar, call all tables “dining tables” no matter the size, shape or formality. For an easier time adding extra diners, pedestal style tables are more forgiving. Because there are no legs around the outside of the table it fitting extra guests around the table is much easier. In a kitchen that doesn’t have an island or has limited counter space, a counter height table can be ideal. Since it will be at the same level as your counters, it can be used like an island to extend your prep area when you need extra space. Because of the unconventional height, they tend to have a casual feel. Consider distressed finishes for wood tables that are utilized on a daily basis. This will disguise nicks and dings that inherently come with life’s activities. If you are utilizing a fine-furniture high end table for daily use, including meals, homework, project table, and such; consider protecting your investment with a table pad and cover. Table top shape: round, square or small rectangle. Rectangular tables 50”-60” long x 36” wide. Typically seats 6 or more. Rectangular shapes are most common.